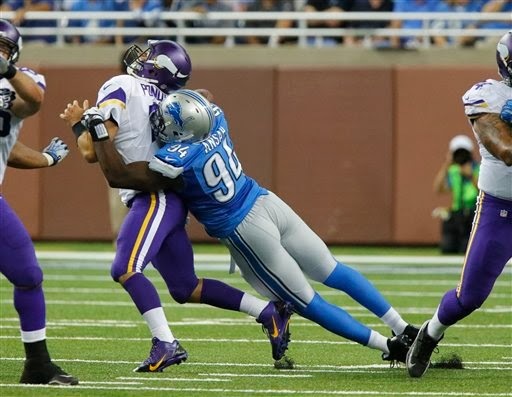 Ezekiel Ansah underwent shoulder surgery a few weeks ago in Los Angeles according to Lions general manager Martin Mayhew. The defensive end, who was a first-round pick in 2013, is rehabbing the shoulder in Los Angeles now. It appeared he injured his shoulder in the snowy Philadelphia game last season, but Mayhew wasn’t sure if that is what led to the surgery. Calvin Johnson’s surgeries on his knee and finger were relatively minor according to Mayhew. Johnson is currently rehabbing the finger. Wide receiver Ryan Broyles, who is coming off Achilles tendon surgery, is on track, Mayhew said. He wasn’t specific whether Broyles will be ready for training camp.